Here are ten songs from the last show of our first European tour. (Please note they aren't from the live LP released on Your Choice Records--that was recorded a year later in Alzey, Germany.) Although the quality of the recording isn't perfect, I think they accurately capture the spirit and feel of a great Verbal Assault gig, and while we wouldn't want to formally release them, they're good enough to put up on the site. Though we tinkered a bit with the sound during mastering, this is essentially a straight board tape from the only cassette that I own. There's some phasing between speakers that can be a little annoying, though you don't notice it as much when you listen to the tracks with headphones or on nicer equipment. 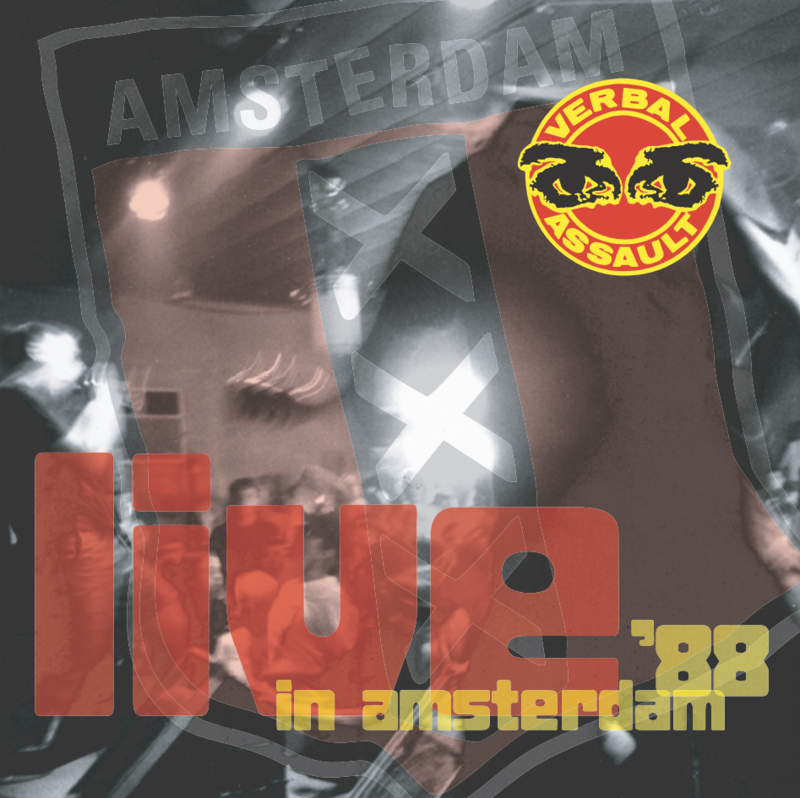 All material was recorded by Marq on Tuesday, 14 June 1988 at the Van Hall in Amsterdam, Holland. Mastered and sequenced by John Jacobson at Sound Station Seven, Providence, RI on 23 August 2000. Thanks to Jack for the artwork, JJ, Marq and Hetty Zwart for making all of this possible, and special thanks to everyone who was there at the gig for making it such a good time. The artwork (by Jack McKenna) is a three page .pdf file. For best results, print it out on glossy photographic paper, then trim the pages to fit the jewel case. Fold the first page in half to make the cover and insert. The second page is for the back of the jewel case. The third is for a CD label (if you really want to go all out). The "cover only" artwork is just that (good for a mobile device). Download this with your live tracks!